Spot silver continues to follow gold higher as the commodity markets in general benefit from the continued dollar weakness and consequent strength in equities, as the current appetite for risk shows no sign of abating, although many market analysts are now suggesting that the US dollar is heavily oversold and due for a short term correction. Yesterday’s wide spread up bar mirrored the move in the gold market, closing the silver trading session deep into the congestion area between $16.50 per ounce and $18.50 per ounce, and with gold providing the momentum, this is helping to push spot silver prices through this deep resistance band. The current bullish momentum is further re-inforced by all three moving averages which are pointing sharply higher. 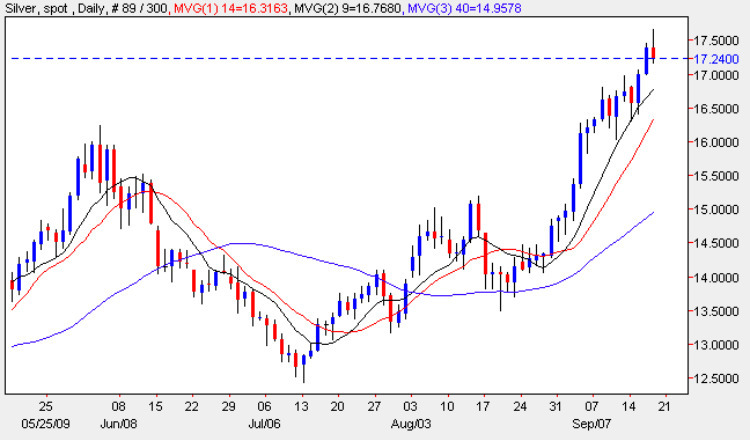 The weekly chart for spot silver also remains bullish with the 9 week moving average having crossed above the 14 week average, and should the current momentum continue then we could see a break and hold above the upper level of this resistance in the $18.50 region, and if so, a push higher into the relatively clear space above.